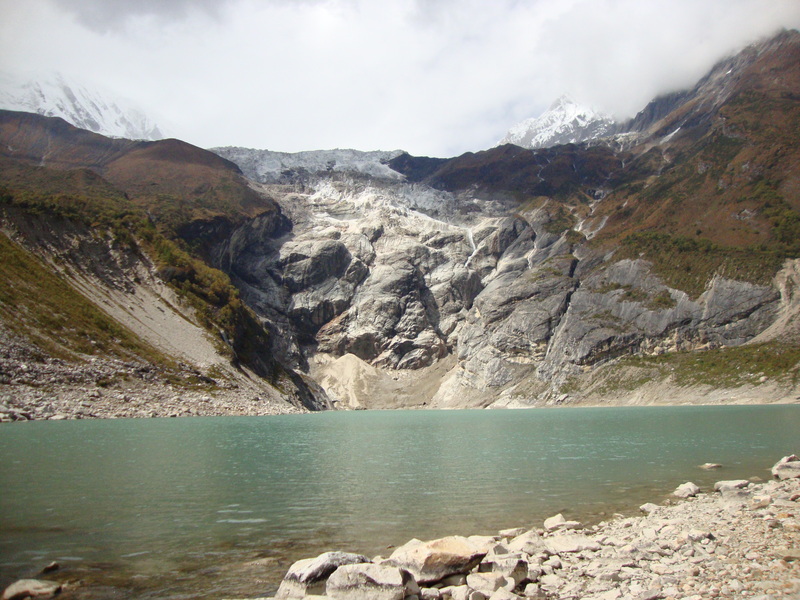 It is a well-known fact in mountaineering that many more accidents happen during the descent from the mountain than on the way to the summit. 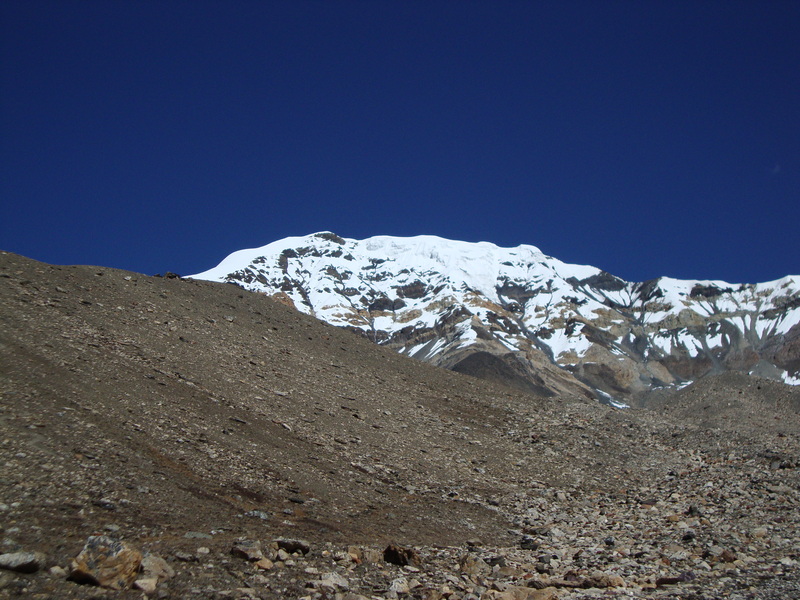 Upon finishing the climb, the mountaineer is either euphoric, tired and distracted after reaching the summit, or depressed, tired and distracted after failing to reach it; in any case, the focus is not entirely where it should be, that is, on one’s surroundings, movements, climbing partners etc. I find descents particularly challenging because of the view – the abyss under my feet. 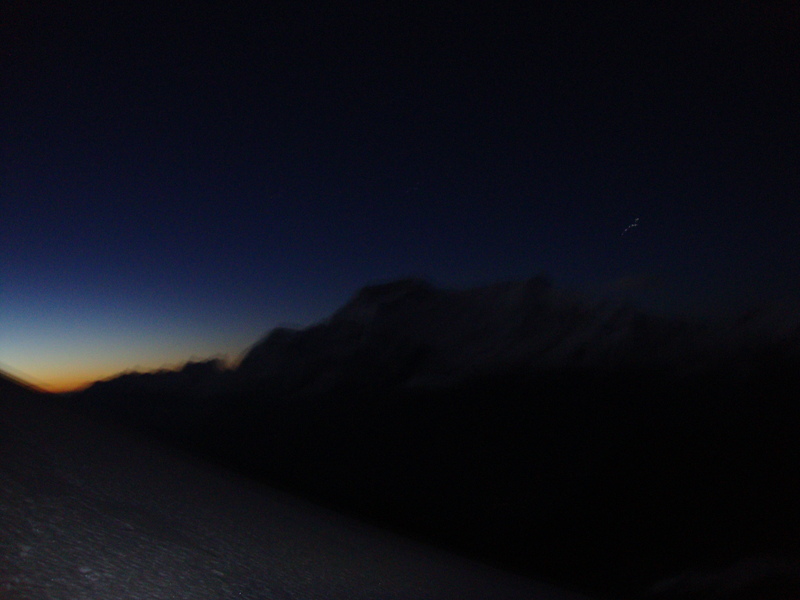 Standing on the summit of Chulu Far East ( about 6100m) just after 4 am on the 21st of October I am aware of the danger I am about to face – the descent down long icy slopes into the night. The light of my head lamp follows the fixed line until they both disappear in the cold blue air of the early morning. The ascent only took me three hours instead of the six I’d planned for and I am slightly disappointed that I won’t get to witness the awakening of the Himalayas from the summit of Chulu; it is too cold and I must descend right away. 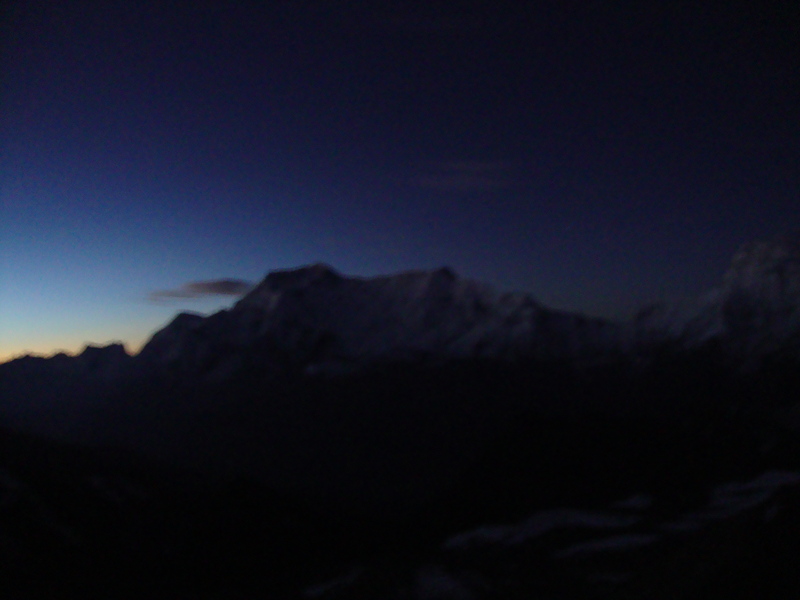 With my ice axe buried deep in the powdery summit snow, I turn my head lamp off and look around: at the white snow and stars, at the black mountains and the abyss I know I will not fall into now… Then, I turn the light back on in the certainty that I have now survived my descent from Manaslu. And it was one tough descent. 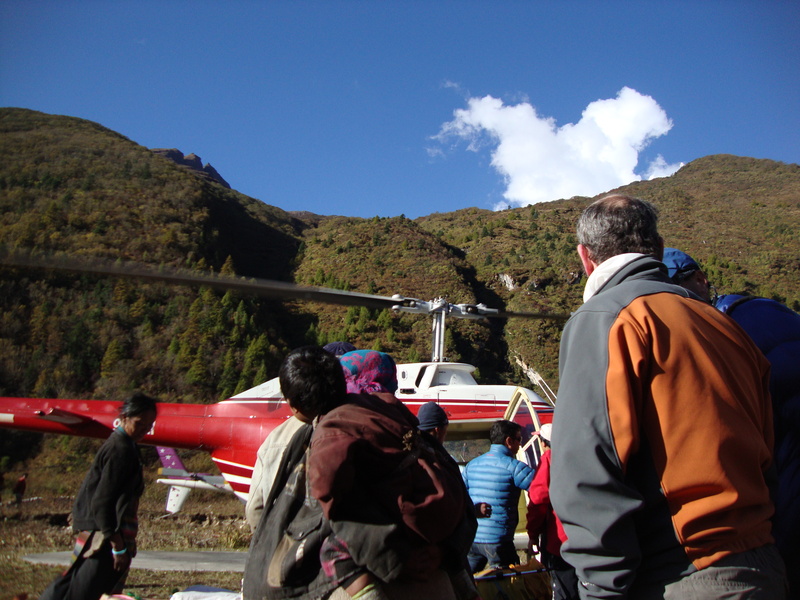 Our expedition team left Manaslu Base Camp for Sama Goan on the 7th of October. On the way down I treated myself to a swim in the glacial lake at the foot of the mountain followed, as always, by a camera and gasps of ‘crazy!’ The purifying, piercing cold of the water was a great relief, and my heart, heavy after the failure to summit Manaslu, beat outrageously fast, as if trying to shake off the doubts and insecurities creeping into it. However, warming up in the sun after the swim, I was once again conscious of the ‘Spirit Mountain’ towering above me – irrevocably. On the 8th of October our team left Sama Goan for Kathmandu. Three tired-looking helicopters stuffed with duffel bags and climbers took off not without effort, and just over an hour later we were driving through the dust and noise of the capital towards our quiet haven of a hotel. For the next five days I would lie in bed staring at the ceiling, trying not to think of anything at all as any fleeting thought would make me feel all the weight of Manaslu on top of my chest. Failure to reach the top of the mountain became the sum of all my failures and instead of dealing with just one I was dealing with them all. It had to stop right there and then. Thus, only six days after my return to Kathmandu I was leaving the city for the mountains again: one of my Manaslu expedition team mates and I decided to attempt a peak called Chulu East (around 6500 metres) in the Annapurna region of the Himalayas. We would be very limited in time as my friend had a plane to catch 12 days after our departure. Therefore, we required a strong team which would be able to keep up with the tight schedule. We believed that just such a team had been put together for us by a trekking/climbing agency manager. Unfortunately, during the trek through the Annapurna region towards Chulu base camp we quickly understood that our porters could not make it. 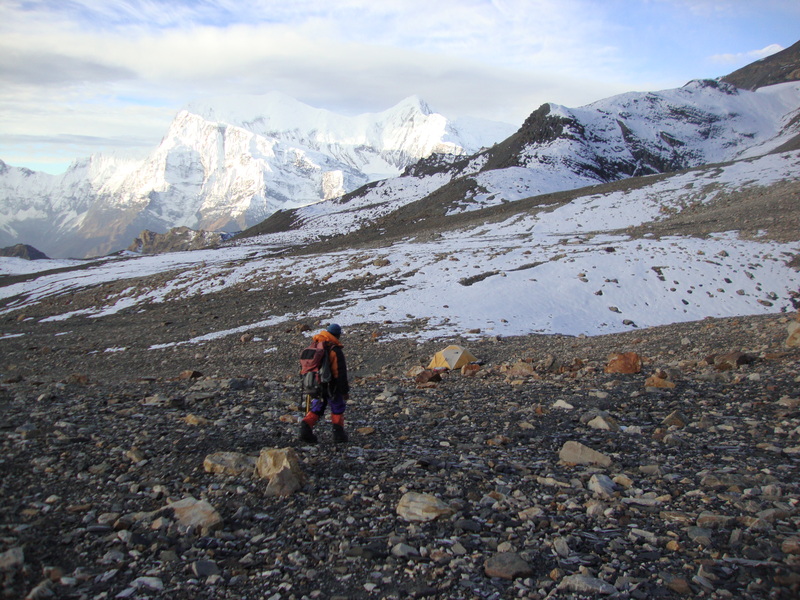 Slowing down, we had to set our sights on Chulu East’s small brother – Chulu Far East, climbing which would save us 2-3 days. 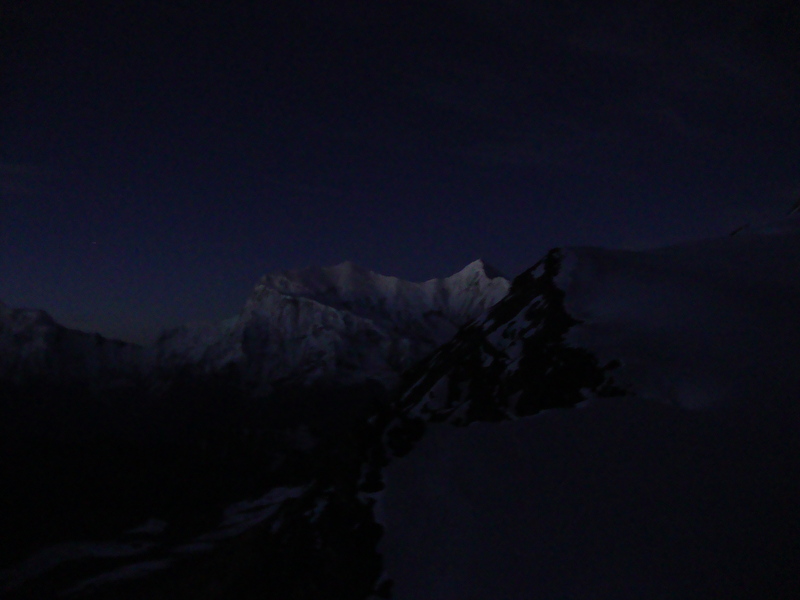 The night of the summit push reminded me of the night at Camp 4 on Manaslu. It seemed to me that I could never leave the tent not to mention climb to the summit. I was beginning to feel sick and angry, and considered giving up. However, at 1 am I managed to drag myself out of the tent and follow my team mate and our climbing guide towards the foot of the mountain. To my surprise, I felt happy and light-hearted almost immediately after we started for the summit, enjoying the climbing very much indeed as we reached the steeper icy sections of the route. I was back in the ‘battlefield’, forgetting the defeat on Manaslu to focus all my energies on every step towards the top of another, albeit much smaller, mountain. In just three hours our team was on the summit of Chulu Far East. Between the big failure on Manaslu and the small success on Chulu I found and tried to retain a sense of calm and of increased understanding of my strengths and weaknesses. Day was slowly dawning over the coliseum formed by the giant mountains of the region – the Annapurnas, Gangapurna and Kangaru- revealing the razor-sharp ridges and the proud vertical walls which challenge climbers to glorious battles. All too often mountains crush or kill but they also have the power to revive and fill one’s whole being with superhuman strength. Standing at the foot of the mountain after a safe descent, I certainly didn’t feel any ‘superhuman strength’ in me – I simply felt like myself again: forgiven, hopeful and full of new ideas. Yesterday I celebrated my 25th birthday in Kathmandu surrounded by friends, eating chocolate cake and plotting my next escape to the Himalayas in whose quiet and cold I have been feeling so strangely at home. Yes the rise is glorious but the descent is deadly. Ask the Romans. Indeed, Carl. I might have been re-living History there, albeit on a much smaller scale. Once you again you’ve provided a wonderful description of the climbs and the emotions that they spark….thanks for these posts. Thank you, and I’m glad you’ve enjoyed this series of posts of which ‘The Descent’ is more than likely to be the last one – the climbing season is coming to an end and there’s a lot of work to be done before I can treat myself to another climb in the Himalays.